Based on the scientific principles mentioned in this article, Montessori primary school teachers present a new exercise while sitting on the right side of the child in order to take advantage of this aspect of hearing. * When reading to your child, consider reading on his or her right hand side. 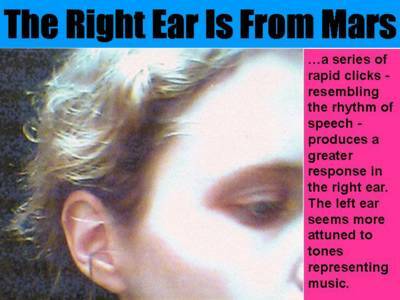 * As the right ear is critical for learning in school, acquaint yourself with hazards that can damage a child’s hearing. In particular, educate your child about how loud an Ipod should be played. Minimize the amount of time, per day, that your child has earphones on. * Encourage your children to protect their ears at concerts. Educate them about how damage to the ear happens.